Arizonans are still waiting to hear who their next senator is, but for tens of thousands of voters, they know that the person they voted for didn’t win. According to the unofficial results released by the Arizona secretary of state, some 43,067 votes were cast for Angela Green, the Green Party candidate who dropped out days before the election. 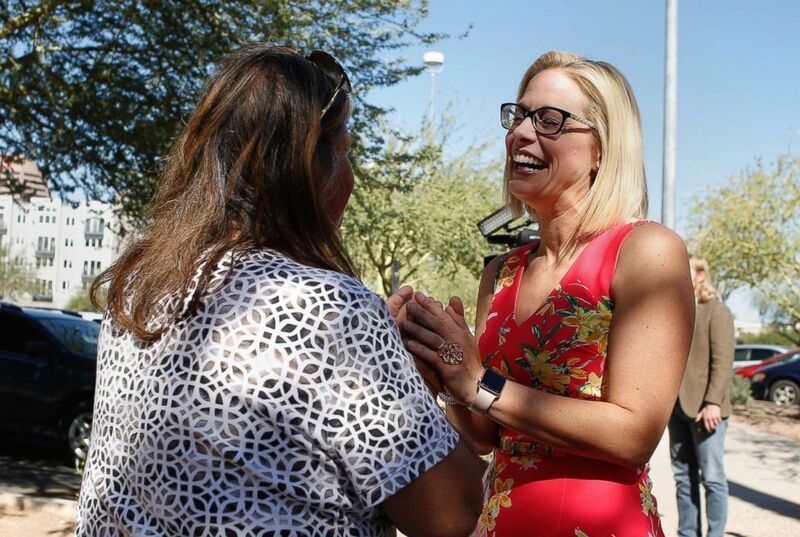 Now she’s facing accusations of being a spoiler, as the vote difference between between Republican Martha McSally and Democrat Kyrsten Sinema has narrowed to 1,977 votes as of Thursday night, with Sinema leading by .1 percent of the total vote. Angela Green is seen in this undated campaign photo. “The word spoiler is maybe a little bit loaded but it’s quite accurate to the situation,” said Hans Noel, an associate professor of government at Georgetown University. Noel said the basic definition of being a spoiler is an election wherein “the outcome of the race could be different” if said candidate had not run. “That’s certainly the case here,” he said. Green ran as the Green Party candidate but dropped out on Nov. 1, five days before Election Day – and endorsed Sinema. “I knew I wasn’t going to win, so being a true candidate for the people and not the politics, I felt that if I withdrew and could endorse a candidate closest to the ideas and views of those whom I represent, then at least I can feel as though this withdrawal from the Senate race will not be in vain,” she wrote. The problem, however, was that early voting in Arizona started on Oct. 10, meaning that not only could voters have cast their mailed ballots for the first 20 days of the voting period, but also that Green’s name would still be listed on mailed ballots and the day-of ballots at polling stations through the close of the election. Democratic Senate candidate Kyrsten Sinema speaks to a supporter at the Barton Barr Central Library, Nov. 6, 2018 in Phoenix. The fight against what they perceive as a broken two-party system is an idea echoed among third party candidates and their supporters, Noel said, but noted that while it could be part of a “long term strategy” to reform political politics, it doesn’t necessarily lead to change in the short term. “I think the thing that often gets overlooked is one of the reasons why you don’t see third parties in a system with single member districts is that it actually isn’t smart for voters to vote for a third party candidate if they care about which of the two major party candidates might win,” Noel said. The nature of deeming a candidate a spoiler is complicated by the fact that the alternative scenario is filled with unknown determining factors, and the motivations of a third party voter is unknowable. Would they have voted for the Democrat or the Republican? Or would they not have voted at all? There’s no way of knowing those answers. Richard Herrera, an associate professor of political science at Arizona State University, says that he doesn’t consider Green to be a spoiler. “The election was always going to be very close, regardless of the number of parties involved,” he said. 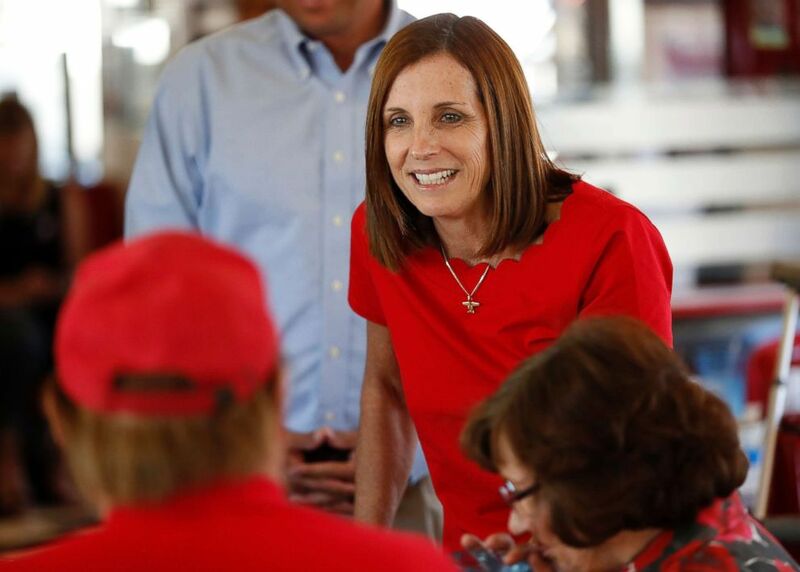 Arizona Republican senatorial candidate Martha McSally, speaks with voters, Nov. 6, 2018, at Chase’s diner in Chandler, Ariz.
“Almost by definition someone who votes for a third party candidate is not interested in winning the election. They’re interested in making a statement that’s ideologically central to their political core and you dilute that message if you vote for the best of two bad alternates, in your mind,” Herrera said. Some of the clearest examples of third party spoilers have been on the presidential level, with Ralph Nader being seen in that role by many in the 2000 election. “If about 1 percent of the Nader vote in Florida had gone to [Democratic presidential candidate Al Gore, then that might have been enough to change the outcome,” Noel said. Another example nearly a century earlier was that of Teddy Roosevelt, the then-former Republican president who ran as a part of the Progressive party while then-incumbent President William Howard Taft ran as the Republican. Roosevelt and Taft effectively split the vote of many Republicans, giving Democrat Woodrow Wilson the highest percentage of the vote and, in turn, the presidency. “As an electorate, we’ve gotten smarter about this and that’s why it doesn’t happen as much anymore,” Noel said. Next articleBrian Kemp declares himself winner in Georgia governor’s race, stepping down as secretary of state. ABC News has not projected a winner.